Who buys cars in North Carolina? We’ll buy them all day long! If you have a unwanted vehicle you would like to get rid of, give us a call. We offer one of the easiest and most efficient ways to turn your wrecked, damaged, or junk into some serious walking money. Old car recycling is the best way to deal with that old clunker you’ve got out in the side yard. Instead of letting that old car sit in your driveway leaking fluids such as anti-freeze and dripping oil, call FreeCash4Cars. These leaks could eventually contaminate local ground water, which makes it unsafe to drink. Our professional drivers provides FREE car removal and towing. Have a damaged car? We can usually beat insurance companies offer for the vehicle! Instead of letting that old thing sit in your yard, tick off your spouse, leak all sorts of fluids everywhere, collect wasp nests and grow moss – get a handful of dollars instead. We take your old vehicle, drain all the fluids, remove parts that are not accepted at the recycling centers and get it back into the recycling flow. That lump of steel in your side yard today could very well end up being part of that shiny NEW truck you buy NEXT year. So not only does it make you a few bucks, it helps out good old planet Earth too by being the green solution! Enlarging markets in Asia have lead to greater interest in scrap steel, reinforcing the market globally. With 14 million short tons of steel from cars being junked each year contributing to an industry-wide total of 76 million tons of recycled steel and iron, it’s not difficult to see that automobile recycling is a HUGE industry worldwide. Recycled steel is cheaper since new ore doesn’t have to be mined to make it. All steel created now has at least 25 percent recycled steel inside, and a few products are manufactured entirely from recycled steel. So in addition to the economic and environmental advantages, recycling cars is an important link in the world’s industrial infrastructure. 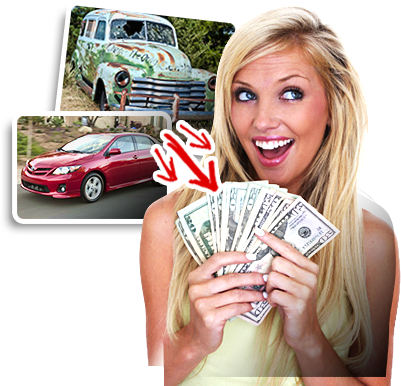 Sell us your Wrecked Car in the Triangle to get same day money in YOUR pocket!